In 2015, researchers at Reiter Berry Farms conducted a trial using GrowPlex™ and SeaMate™ on strawberries in Salinas, California. The trial consisted of three treatments. The first treatment, Control, was the grower’s standard fertility program. The second treatment, GrowPlex, had 2 oz of GrowPlex™ per acre added to the fertility program each week. The third trial treatment, SeaMate, had 2 oz of SeaMate™ per acre added to the fertility program each week. 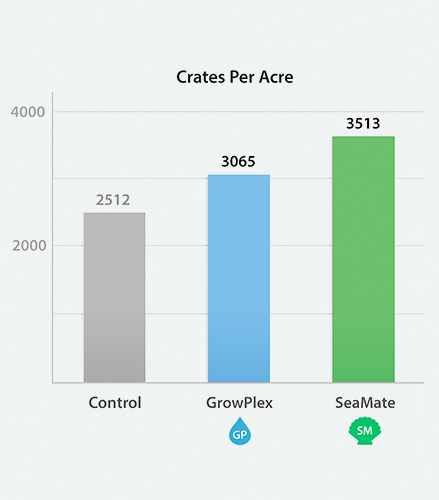 Treated rows experienced a 39.8% increase in yield with SeaMate™ and a 22% increase in yield with GrowPlex™. Rows treated with SeaMate™ and GrowPlex™ showed more consistent sizing and health, and they produced longer into the season.